Step out of time in order to save the very fabric of Creation. "I use this staff to make right what once went wrong!" 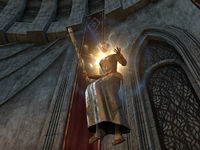 Loremaster Celarus's apprentice, Josajeh, stole the eight fragments of the Staff of Towers and fled to Tamriel. She no doubt plans to reforge the staff and use it to alter time. The results could be catastrophic. I must stop her before it's too late. "We're close. Give me a shake, eh?" "What is this? Magic? You will pay for summoning me, weaklings!" "I'll see to Josajeh's welfare and ensure the staff is recovered. Return to Artaeum when you are ready." Travel to Divad's Chagrin Mine in the Alik'r Desert. Find the gaping time breach and enter it to travel to the Imperial Throne Room. Take the portal back to Artaeum and travel to Ceporah Tower. All right. How are we going to find her? "I looked through her things. An abominable breach of confidence, I know. In any event, I found some renderings of a mine her family once owned—Divad's Chagrin. It is both remote and largely untouched by world events. Perfect for her endeavor." Do you think she's hiding in this mine? "Not for long. A familiar place can serve as a temporal anchor. If she went to Divad's Chagrin, she almost certainly plans to use it as a springboard into an unfamiliar place ... an unfamiliar time. Take the Augur and these seals and find this mine." Don't worry. I'll travel to Divad's Chagrin Mine and stop Josajeh before it's too late. You now receive The Augur of the Obscure and 3 Psijic Seals. Travel to Divad's Chagrin Mine in the Alik'r Desert, Josajeh's homeland. Upon entering the Augur remarks: There's a time breach around here for sure, mate. And it's not petite. I hope you're sure about this—for your sake, I mean. The time breach is located in the southwest corner of the cave in which the boss resides. If you're near, the Augur remarks to you: We're close. Give me a shake, eh?. Now use the Augur to be able to see the time breach, upon which the Augur remarks There it is. After you, I guess? Hope you ate something light!. 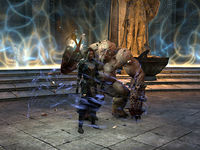 Go through the Gaping Time Breach to enter the Time-Lost Throne Room and find Josajeh. She started the ritual claiming I use this staff to make right what once went wrong!, and as the Augur remarks: The staff is tearing her apart! Things are about to get very weird, mate!. Stop the ritual by sealing each time breach, which will appear after defeating one of Josajeh's alternate timeline selves, see the table below. Captain Josajeh An intruder in the emperor's sanctum? To me! Slay the invaders! A Josajeh from an alternate time-line? She doesn't look happy! The time breach is vulnerable, now seal it up tight! Josajeh, Duchess of Worms What is this? Magic? You will pay for summoning me, weaklings! Another angry Josajeh, incoming! And she brought her brother along. Charming. Another breach to seal! Hop to hero! Ritemaster Josajeh The Staff of Towers! At last! Time is mine to control! You will not stand in my way! Josajeh the evil Psijic tyrant? Drew the short straw on this one, mate. Let's take her down! That breach—it's the last of them. Seal it! After sealing the last breach the Augur will remark: It's over. Good work, for a meat-brain I mean.. The Loremaster and Relicmaster will enter and you should talk to Josajeh. "Is it ...? I'm sorry. I'm so sorry! Was anyone hurt? I will never forgive myself if someone ..."
No one was hurt. Why did you do it, Josajeh? "You know why, initiate. Everyone knows why. I looked at the Staff of Towers and saw a world without consequences. A world where no sin, small or large, would go unpunished. Where nothing broken was beyond repair. I ... I was wrong." You could have destroyed time. "I know. But some pain ... some pain runs so deep that it blinds you. Weakens your senses. Makes you believe in the impossible. Have you ever felt a pain like that? What's time compared to all the people you love? It doesn't make sense, I know." Do you think the Order will take you back? "No. And they shouldn't. I betrayed the Loremaster's confidence. Betrayed the Old Ways—everything the Psijics stand for. No, I will face my justice. I will accept the punishment, whatever it is." Travel to Artaeum and enter Ceporah Tower, upon which the Augur will remark: So our adventure is coming to an end, eh? Look, can we .. can we talk in private? The Athenaeum, maybe? It won't be a moment.. Talk to the Augur after placing it on the tabletop in the Athenaeum. "Thanks, mate. I know you've got other adventures ahead, but I wanted to just take a moment and speak face to ... crystal sort-of face." Sure. What did you want to talk about? When we set out, I held you to a promise. You said if I helped you, you'd try to keep me out of the Psijic vault. Well, I helped. So ...?" If you know everything, don't you already know what I'm going to do? "Ha! I knew you were clever. In answer to your direct question, yes, I know what you'll do. But I want you to look at me when you say it. So you're also saying it to yourself, see? A moment of truth and self-reflection! How exciting!" I haven't decided what I'm going to do yet. "Ah, the hero demurs. Well, I suppose we'll find out soon enough. But enough of that. This might be our last farewell, mate! What's the custom? Lifting a vessel full of that swill you pour down your face-hole and saying something saccharine?" "So ... are we setting out, or should I find a book to read?" "Yeah, of course. I could do with a bit of quiet and fresh air. Your bag, while cozy, is very, very loud." Did you enjoy our travels? "Did I? Does an oblate cogni-form have infinite angles? Please don't hurt yourself. The answer is yes. It was great. The sights, the smells, the incessant jangle of all your gear on my face. Dream come true, mate!" Do you feel any different about us "meat-brains" now? "Pfft. No. Truth is, I;ve always known you bipeds have potential. Sure, most of you just stumble through your laughably short lives, making smaller versions of yourselves, urinating ... cobbling shoes, I don't know. But every so often, there's a you." "Sure. Must be hard hoguh. Knowing you're a lion among endless hordes of baby-rearing, urinating, shoe-making sheep. How you keep from just slaughtering them all and conquering this place, I'll never know. Not that I advocate that sort of thing!" "That, my friend, depends entirely on you. If you put me back into the vault, I'll spend my days plotting another escape. In between bouts of violently cursing your name and swearing revenge, of course." And if I set you free? "I suppose I'll find a new bag to settle in. Maybe Josajeh's? I always liked her, and I think she's already got one boot out the door. She might not be quite as adventurous as you, but I'd take anyone over another century of boring questions." Guess I have some thinking to do. "You know, the fact that you didn't make your mind up about this thirty or so time breaches ago gives me cause to worry. But don't stew over it, mate. Either way, I'll make do. What's another few hundred years in the grand scheme of things, eh?" All right, I don't have any more questions. We should get going. "So, it's back in the bag I go, eh? Fair enough. Just try to make a little more room, all right? I like lumps of ore and rodent meat as much as the next trans-dimensional entity, but it gets ridiculous in there sometimes." You will again receive The Augur of the Obscure. Now go see Loremaster Celarus. "Ah, it does my heart good to see you, initiate. The events of the last few days ... I must admit, they have taken a toll. I was just preparing Josajeh's proclamation of banishment. Not a simple task, I can tell you." So she's being ejected from the Psijic Order? "Surely this comes as no surprise. She deceived me and the Ritemaster, stole an artifact of unimaginable power, and very nearly broke time itself. Exile is our only recourse. This brings me no joy. I care deeply for Josajeh. It is ... it is tragic." What will happen to the Staff of Towers? "Relicmaster Glenadir sealed it in the Vault of Moawita, and there it will remain. So long as I draw breath, that staff will never again see the light of day." Can we discuss the Augur of the Obscure? It agreed to help us on the condition that I set it free. "I would not have entered into such a bargain. But given the circumstances, I understand. 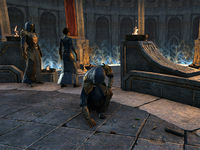 The Augur served us well, but we cannot permit objects of such power to roam free in Tamriel. In the wrong hands, its gift of foresight could prove costly. / I understand that you entered into an arrangement with the Augur, but an object like that—particularly an object with its ... unique disposition—cannot roam free. "A bold suggestion considering her recent exploits. Still. Josajeh is thirsty for answers, and the Augur is bound to provide honest counsel. Yes. Yes, this may work. The Augur will go to Josajeh. She waits outside, preparing for her journey." Good. I'll take the Augur to her now. "We must endeavor to keep our word, initiate. Bargains struck must be honored whenever possible. In this case, however, you made a prudent choice. Both the Augur and the world are made safer by it. Deliver it to the vault and say your farewells." I'll take it to Relicmaster Glenadir immediately. If you choose to let the Augur go with Josajeh, find her next. She can be found below Ceporah Tower, in the northeast. "It's beautiful, isn't it? Even after all these years, I'm still in awe of this place. And now I'll never see it again. Forgive me. We both know this is a fate I brought upon myself. Is there something you need, initiate?" Celarus agreed to let the Augur leave the island ... under your supervision. "He ... he'd entrust this to me? After all I did? How I disappointed him? I don't know what to say. Actually, come to think of it, I do. I will never disappoint my mentor again. I may be exiled, but the Augur and I will make a better world." "You don't know what this means to me—to have a friend on such a lonely journey. Thank you. I hope you'll see me off. I'm to meet the Loremaster at the portal to Tamriel." I have an errand to run, but I'll be there shortly. Now go to Relicmaster Glenadir, at the pond between the vault and the portal to Tamriel, and talk to him. "Tranquil greetings, initiate. Have you come to deliver the Augur of the Obscure? I cleared a place for it in the vault. All is prepared!" Celarus asked me to inform you that the Augur of the Obscure will not be returning to the vault. It was my understanding that the Augur's work was concluded. Does Celarus plan to use it for some other purpose?" Actually, Josajeh will take it with her into exile. "Josajeh? Well, that is an unlikely choice. But I defer, of course. Celarus was blind to her motives before, but he knows her heart quite well now—of that I am certain! If he thinks she is equal to the task, so be it. Thank you for informing me." If you choose to return the Augur to the Vault, make your way to the Vault of Maowita. Along the way, the Augur will have some commentary. "so, what did Celarus say? Am I free to travel the world? I'm ready for another adventure!" "The portal! We're heading to the portal to leave Artaeum? Oh, I can't tell you how happy this makes me, mate!" "Wait, why are we going to the vault? Why would we—oh." "Well, I'm sure you did what you could, eh? I know you'd never let this happen if you had a choice." "I can't stand the idea of getting trapped in that vault again. Maybe I'll go to sleep. Yeah, a good long slumber to wash away the sadness." Inside the Vault of Maowita, Relicmaster Glenadir will have some alternate initial dialogue. "Ah. The Augur. Excellent! Place it inside, please. I assure you, it will be quite safe here." Place the Augur on the tabletop. The Augur will have a final word for you. "Thanks for giving me at least a taste of freedom before the end. So long, mate." Head to the portal to Tamriel and talk to Josajeh. "Well, I guess this is goodbye. I'll take good care of the Augur, you have my word. Do you have any idea where you'll go? "First? I think I'll go home. To the Alik'r. I have a lot of ghosts to confront—choices to make peace with. Changing the past was always a mirage. All we can do is face it and persevere." "I'll do what I can to ease my family's burdens. To rebuild a sense of hope and set them back on the path to happiness. Then? Travel. Definitely travel. As much as I love this place, there's a whole world to explore out there." On the approach, Josajeh and Loremaster Celarus will share an exchange. "I'm so sorry for disappointing you, loremaster." "It is as I always said, Josajeh. Failure is an opportunity for growth. I hope this exile will lead you to better things." Only the initial dialogue is different. "Well, I guess this is goodbye. Talk to Loremaster Celarus, also at the portal. Rest easy. I am certain that both Josajeh and the Augur will be fine. No—they will do better than that. They will thrive." "Now you reap the harvest of your good works. Through your dedication and heroism you have proved your worthiness. So, I present this final gift. Beyond this, there is nothing I can teach you. Let the Old Ways proclaim—you are now a true Psijic." "You needn't worry. Both Josajeh and the Augur will be fine. True, the skull may resent your choice for a while—but dissatisfied safety is better than blissful danger." 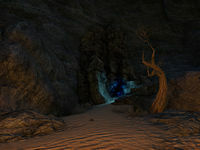 According to Loremaster Celarus, his apprentice probably went to a mine called Divad's Chagrin. I should travel to this mine to look for Josajeh. The Augur senses a time breach nearby. I must use its sight to locate the time breach. I found a gaping time breach that Josajeh likely used as a portal. I should follow her through it to see where (or when) it leads. I found Josajeh in a bizarre alternative version of the Imperial Throne room! I must stop her ritual before it spins completely out of control. I turned back the tide of converging time-lines and freed Josajeh from the staff's violent influence. Now that the threat has passed, I should talk to her. Josajeh agreed to respect the Psijics' decision for her future. I should return to Artaeum to see how this plays out. I must enter Ceporah Tower to speak with Celarus about everything that happened with Josajeh. The Augur asked to speak with me privately before I return to Loremaster Celarus. I should take it to the Athenaeum and find out what it wants. I placed the Augur on a table in Ceporah Tower's Athenaeum so we can speak at length. I gave the Augur a hearing. Perhaps I will ask it a question or two before we set out. Now that I've settled my business with the Augur, I should return to Loremaster Celarus. The Augur of the Obscure's fate rests in my hands. I must choose whether to return it to the Psijic Vault, or give it to Josajeh for safekeeping. I chose to free the Augur. I should deliver the oddity to Josajeh. Josajeh agreed to take the Augur. I should inform the Psijic Relicmaster of my choice. I informed the Relicmaster that the Augur was leaving. Now, I should catch up with Josajeh before she leaves the island. Finishes quest I should talk to Loremaster Celarus to receive my final reward. This page was last modified on 27 January 2019, at 09:33.